When it comes to giant rat infestations, New York gets all the attention. But a breed of giant Gambian rats have been rapidly reproducing in the Florida Keys despite a decade-long effort to wipe them out. KeysNet reports the invasive African native species first began showing up between 1999-2001 after a local exotic animal breeder released eight of the rats into the wild. "We thought we had them whipped as of 2009," said Scott Hardin, exotic species coordinator for Florida's Fish and Wildlife Conservation Commission. "We think they have not moved far but they clearly reproduced," he said. 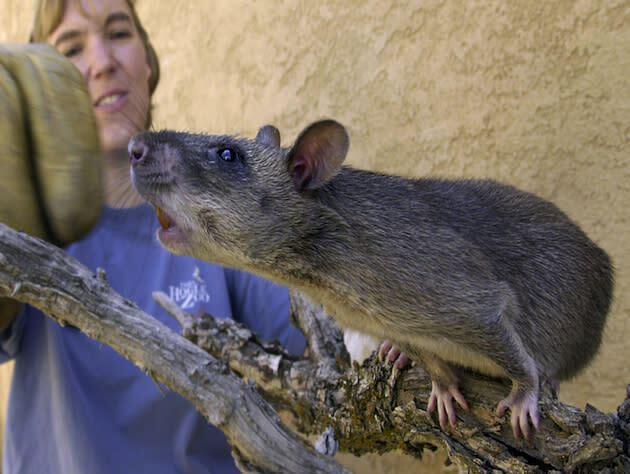 The rodents, officially known as the Gambian pouched rat, are the largest known breed of rats in the world. They can grow up to three feet in length and weigh as much as nine pounds. Wildlife officials fear that if the rodents make it to the Florida mainland, they could devastate local crops. The U.S. Department of Agriculture has been working with Florida officials to wipe out the rodents, and there are only an estimated few dozen at large, but they can reproduce quickly and do so only five months after being born. After producing a litter, the Gambian rat only has to wait another nine months before having another litter, bearing up to six babies at a time. Officials thought they had successfully gotten rid of all of the Gambian rats back in 2008, but several of the burrowing creatures recently began showing up in the yards of local residents. "We were skeptical but went back and talked to people and [saw] there were rats that we missed," Hardin told KeysNet. Using cantaloupe and peanut butter as bait, officials plan to distribute another 200 traps in an effort to clear the keys of the Gambian rats, some of which are larger than the average house cat. "We're going to try to trap at least that often until we see signs that we have knocked them back," Hardin said.